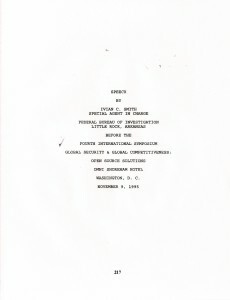 Ivian Smith, just prior to going to Little Rock during a Clinton Administration, was the top FBI executive for dealing with CIA on open source intelligence and related matters. His critique of both CIA and FBI is devastating–and this was in 1995, long before the litany of errors that allowed 9-11 to happen came to light. His book is less about spies and more about local, state, and federal political corruption as well as FBI incompetency, and highly recommended. The government is a beneficiary of public intelligence, NOT a source of public intelligence. We’re on our own.